Kate Christensen is the owner and founder of Phoenix based Katherine Christensen & Associates, Inc., (KCA); Kate & Company Events and the hip yet historic venue, SoHo63. Christensen has developed her companies and managed various types of worldwide events for clients. She has received praise from many business owners for her affordable, well-focused strategies and successful events. 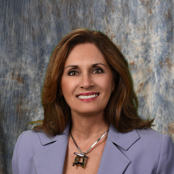 She has been listed in the Phoenix Business Journal’s Top 25 Meeting and Event professionals for nearly 20 years. With a seasoned staff, Christensen has worked with large and small corporations, associations, community and philanthropic clients. Designing and executing client events have ranged from fund raisers and golf tournaments/silent auctions to conferences, conventions and meetings to high end incentive programs. Obtaining the designations of Certified Meeting Professional (CMP) and Destination Management Certified Professional (DMCP), she has given back to the industry and community by serving in several organizations including being a past president of Meeting Professionals International – Arizona Sunbelt Chapter and serving on the Board of Directors for: ITS Arizona, WTS – Arizona, Boys and Girls Clubs of Tempe, Society of Incentive Travel Executives (SITE), Ahwatukee Chamber of Commerce and Ahwatukee Community Foundation and Women’s Business Enterprise Council Forum (Arizona). She speaks about her profession several times a year to ASU and Scottsdale Community College students and writes frequently for industry publications. Christensen and her husband have two adult children, five grandchildren and reside in Chandler with their Shih Tzu, Koko. Fun Fact: Loves to ski, travel and enjoys target shooting.